How to Safely Use a PC and the Internet: Fear Them No More! As the MicroSolved team strives to bring quality service to our clients, we also make every effort to educate the masses and try to contribute not only to the Info Sec community, but to the “average Joe” out there trying to bank online, check email, or use Facebook without sacrificing their digital security or personal identity. It’s human nature to fear the unknown. We don’t like to deal with things we don’t understand. Once upon a time, it might have been ok to just avoid what we didn’t know. But today’s world is becoming more and more reliant on machines, computers, and the Internet. Before, a person used be able to go through life without knowing how to work with technology. Today this is becoming more difficult. People use computers at work, at home, and at the store. Children are required to do papers, reports, and projects on a computer- it’s not something that can be easily circumvented any longer. This being said, it is time to STOP fearing these things. The only way to do is it to face the fear. Realize the machines only do what they’re told- you just need to know how to give the proper orders. Computers are dumb. They’re basically a digital filing cabinet which holds files with digital instructions on them. They can be manipulated to the will of the user, and can be helpful tools once the apprehension subsides. 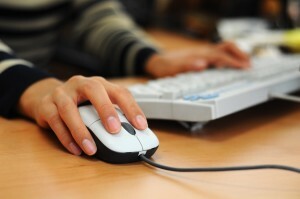 Take a basic course on how to use a PC and the Internet- they’re not costly and should be readily available. If you have trouble finding one, ask around. Many libraries and community centers offer basic introduction courses either for free or at low cost. You don’t need to be a Windows Jedi or a Linux Guru to operate these machines. The Internet is a staggering creation of man. Nearly everything in the world can be accessed in some form online. Learn what a web browser is, what it does, how to operate it, and how it should behave. Learn to pay attention to how your browser acts when surfing and how commonly visited pages act. When something changes don’t dismiss it! These changes can indicate unsafe conditions and should not be ignored. Using the Internet is a responsibility and users need to be aware when they’re online. Over the coming weeks, the MicroSolved team will be working to create blog and video content focused on educating end users to keep them safe while surfing the web. If you have a topic you’d like to see covered, contact us! We’re always excited to hear from you. This entry was posted in End-user Focused and tagged Internet Safety by Phil Grimes. Bookmark the permalink. Phil Grimes was a Security Analyst for MicroSolved, Inc.